With equities slowly unravelling into the weekly close, the VIX battled higher, settling +5.1% @ 13.86 (intra high 14.00). Near term outlook is for renewed equity weakness. 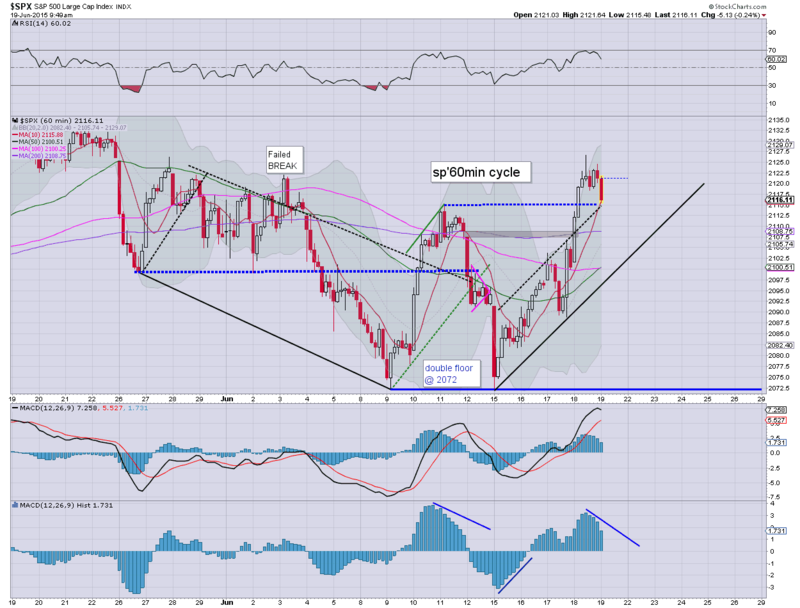 The bigger VIX weekly cycle is offering the 16/17s in the immediate term. The big 20 threshold still looks difficult to hit. *the VIX saw a fractional net weekly gain of 0.6%. 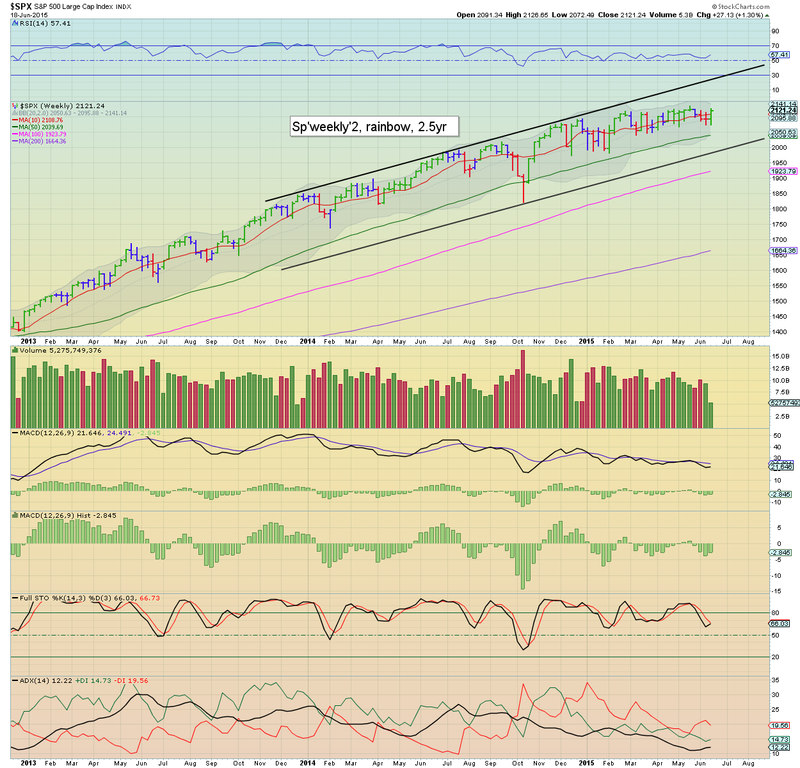 So, a tiny net weekly gain... after the sp'500 climbed from 2072 to a Thursday high of 2126, and settling Friday at 2109. Most notable, the weekly MACD (blue bar histogram) cycle, ticked higher for the eighth consecutive week, and is now positive cycle for the first time since early February. Clearly, momentum is now a touch in favour of the equity bears. Upper bol' on the weekly cycle is offering VIX 16/17s early next week. The key 20 threshold still looks difficult to break and hold above. Right now, sustained action in the VIX 20s does not look viable until end June/early July, at which point Greece may have already nationalised the banking system and defaulted on much of its foreign held debt. US equity indexes closed moderately lower, sp -11pts @ 2109. 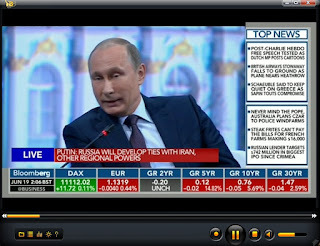 The two leaders - Trans/R2K, settled -0.4% and u/c respectively. 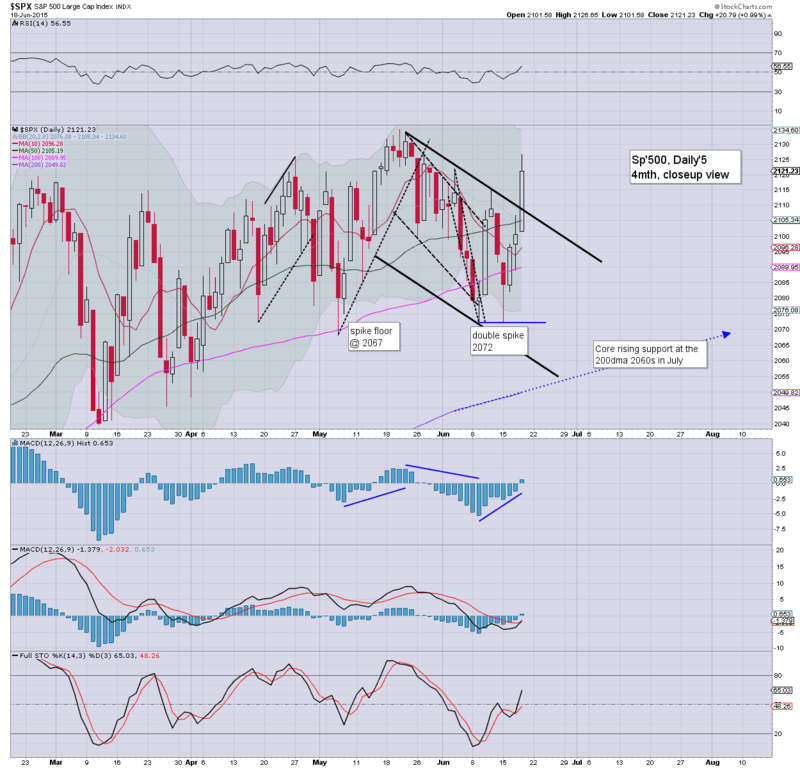 Near term outlook is bearish for next week, as the Greek situation continues to spiral out of control. 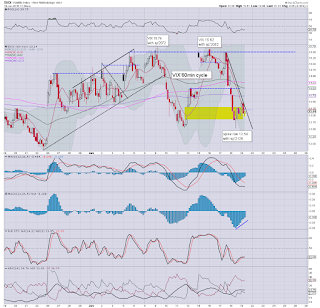 The recent double floor of sp'2072 looks highly vulnerable before month end. *closing hour was some further weakness, but clearly, nothing significant. ... a pretty interesting week, with the sp'500 starting the week on a down note.. to 2072.. but then a sharp 3 day ramp to 2126. The increasing weakness into the weekend was entirely natural as a fair few traders understandably did not want to hold across the weekend. US equities remain moderately weak, but with the 'Greek situation' set to spiral out of control (1bn a day in bank outflows.. and accelerating)... there is high risk of fair number of the bulls will want to exit into the weekend. A daily close in the sp'2110/05 zone remains very viable... along with VIX 14s. ... well, lets see if the rats do indeed sell into the weekend. I would be very surprised if we don't break a new intraday low in the closing hour. *I will hold short INTC, and long VIX across the weekend. 3.25pm.. VIX 13.80s... sp'2110..... should be further weakness into the close. After all, seriously.. who the hell would want to be going long into next week, as the queues at the Greek ATM machines make it quite clear... a bank run is in progress.. they are set to see a complete implosion of their banking system. With Gold -$2, GDX is seeing some notable weakness, -2.6%.. which is kinda surprising. Eyes sharp.. into the close! US equities remain slightly weak... with some rather natural quad-opex price chop. Price structure on the hourly sp'500 cycle is offering a bull flag into next week, but there remains the threat of 'rats selling into the weekend'. 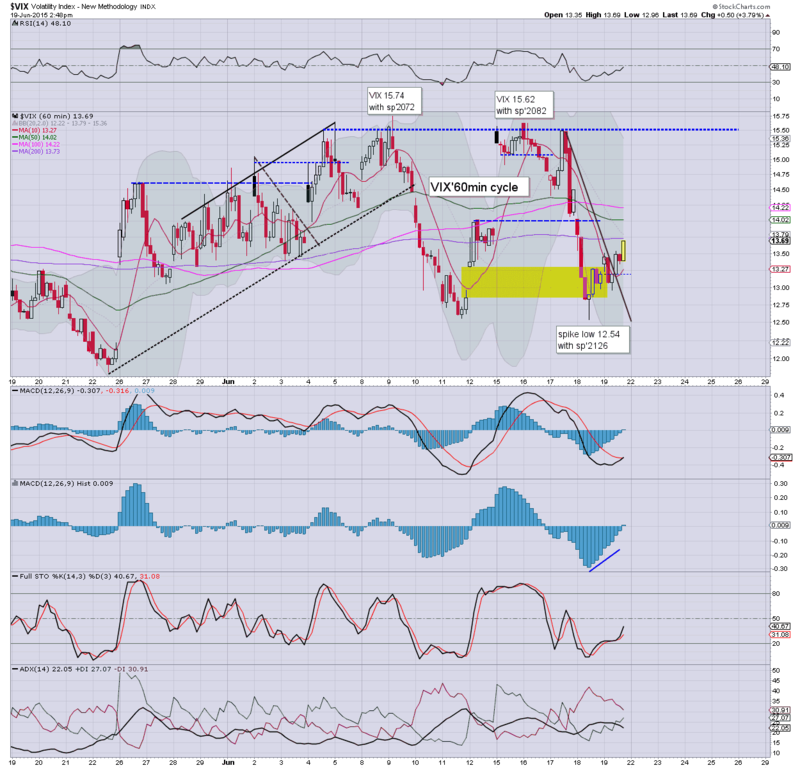 Oil remains especially weak, -1.8% in the $59s. Typical turn time is 2.30pm... perhaps the bears will start to show increasing downside power from that time. 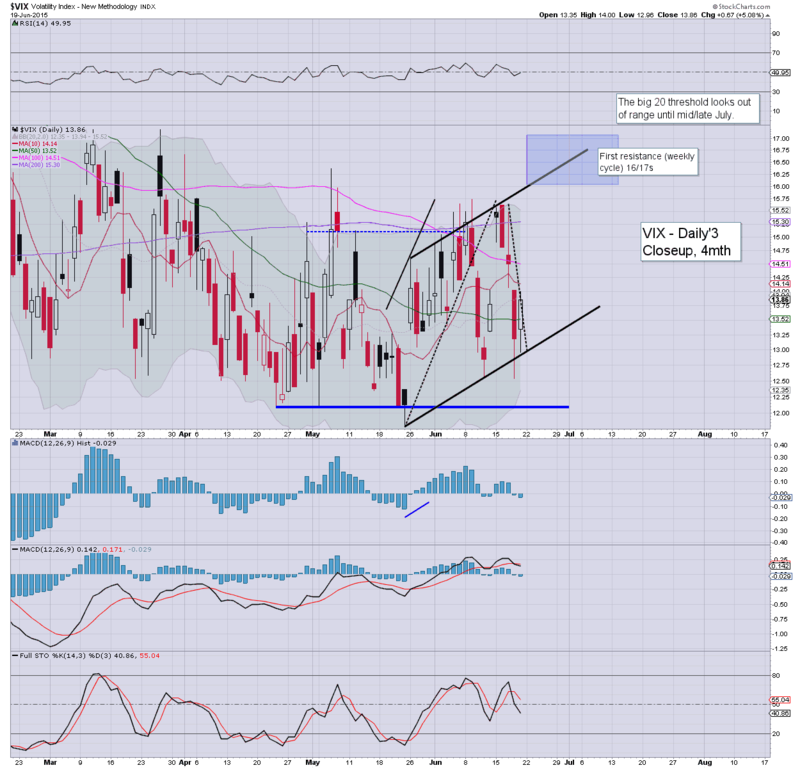 VIX is holding minor gains of 1.4% in the 13.40s... a daily close in the 14s would be very useful. With the loss of $32, we now have a bearish engulfing candle on the daily.. a break under the flag looks highly probable next week. 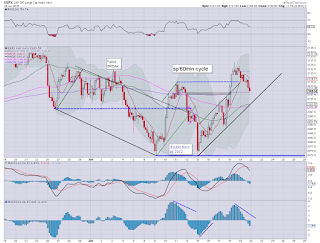 If correct, it bodes in favour of downside for the broader market. 2.30pm.. The rats are already starting to get twitchy ahead of the weekend... sp -8pts @ 2112.. with VIX 13.60s..
.. its just starting to get a little interesting. 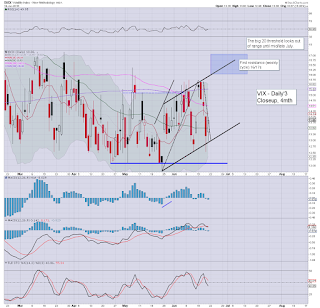 The VIX remains relatively subdued in the mid 13s, but from a technical perspective, it has broken out of the down trend. A daily close in the 14s looks probable... as supported via the hourly cycle. The bigger weekly cycle is offering the 16/17s next week... although that in itself is still a historically low VIX. Now it is simply a case of how many of the rats will want to bail into the weekend. Considering the building Greek situation... it could get rather interesting in the closing hour. 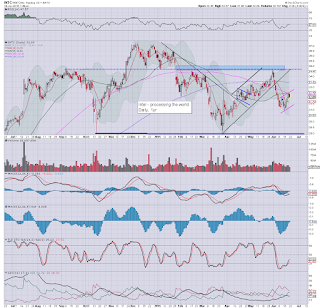 *I've eyes on INTC, which looks set to lose the $32 threshold... if so.. that would make for a bearish engulfing candle.. and would be a particularly bearish setup for next week. US equities remain a little lower, with the hourly equity cycle offering first opportunity of sustained downside in the late afternoon. VIX remains very subdued in the low 13s, the bigger weekly cycle is offering 16/17s early next week. USD is a little higher, +0.2% in the DXY 94.20s. *I picked up a VIX block in the past hour... VIX 12s are crazy low.. and a move to the mid/upper teens looks viable next week. I've Oct' calls, so the ticking detonator clock is not a concern. I can sustain 11s.. even 10s, without being rattled. Overall, it remains a very quiet market... although it is quad-opex.. so we should see increasing price action as the afternoon proceeds. 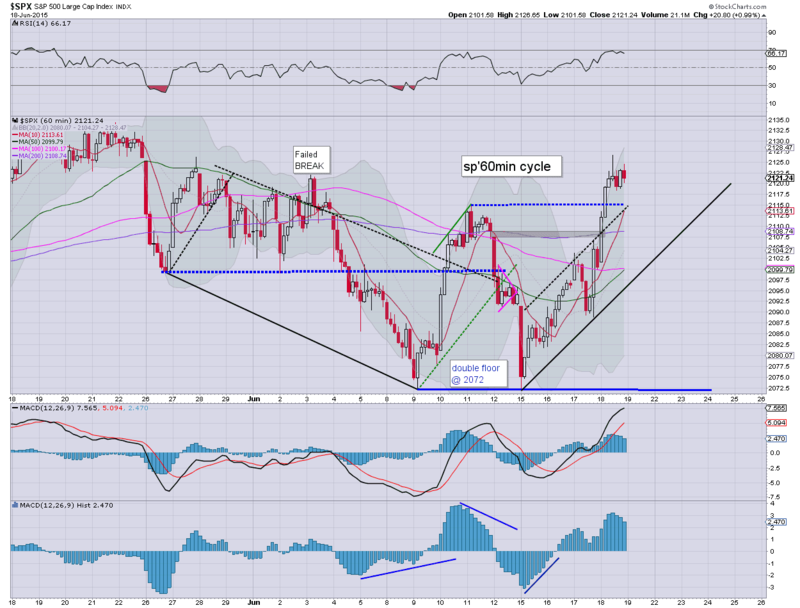 From a pure cycle perspective, the hourly equity/VIX cycle are warning of market weakness into the weekly close. 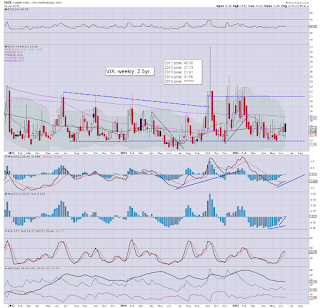 12.26pm.. VIX has broken the down trend.... 13.52... and rising. A daily close in the 14s would be... useful. Yours... short INTC.. and long VIX. 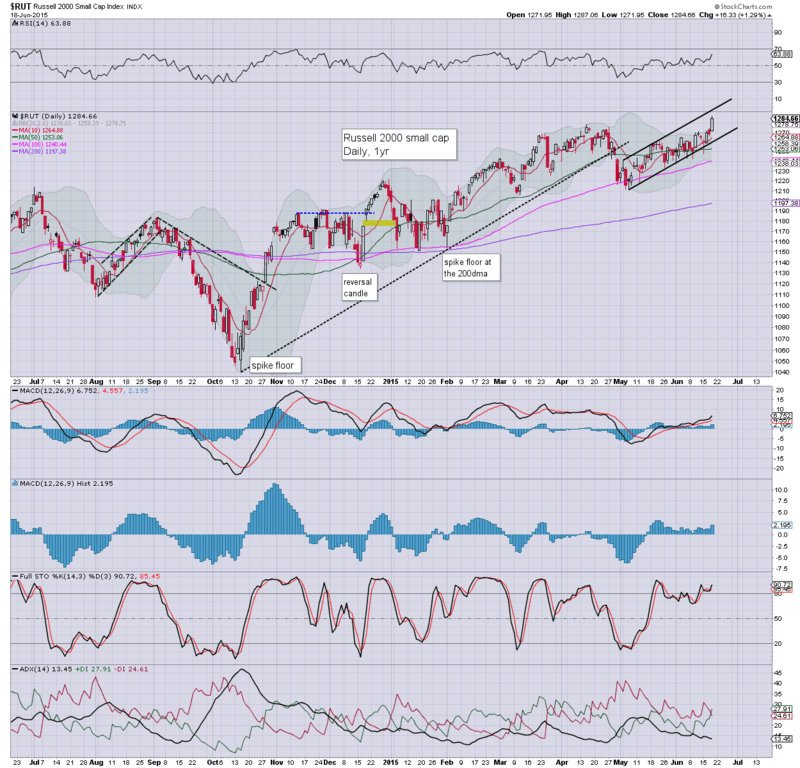 US equities remain in minor chop mode... with more significant weakness due this afternoon. VIX remains bizarrely subdued in the low 13s... as the Greek bank run accelerates. USD is broadly flat in the low DXY 94s. There remains sig' weakness in Oil, -1.7%... flirting around the $60 threshold. Without question... the GREEK banking system is imploding at an accelerating rate.. as the remaining fools who haven't yet cleared out their accounts are starting to make a run for it. Dear Greek depositors, would you like to withdraw your Euros... or perhaps you'd like some semi-worthless Drachma instead? A relatively quiet morning in market land.. as reflected in the VIX. The market has a fair chance of seeing a snap lower this afternoon...certainly.. the setup looks bearish into the weekly close. Price structure is a crystal clear bear flag.... and the bigger H/S formation is offering next target of the low $29s... with 26/25 in the late summer. I remain short.. and will probably be trading in/out of INTC a fair few times in the months ahead... always on the short side. 11.25am.. I am LONG VIX from 12.98. 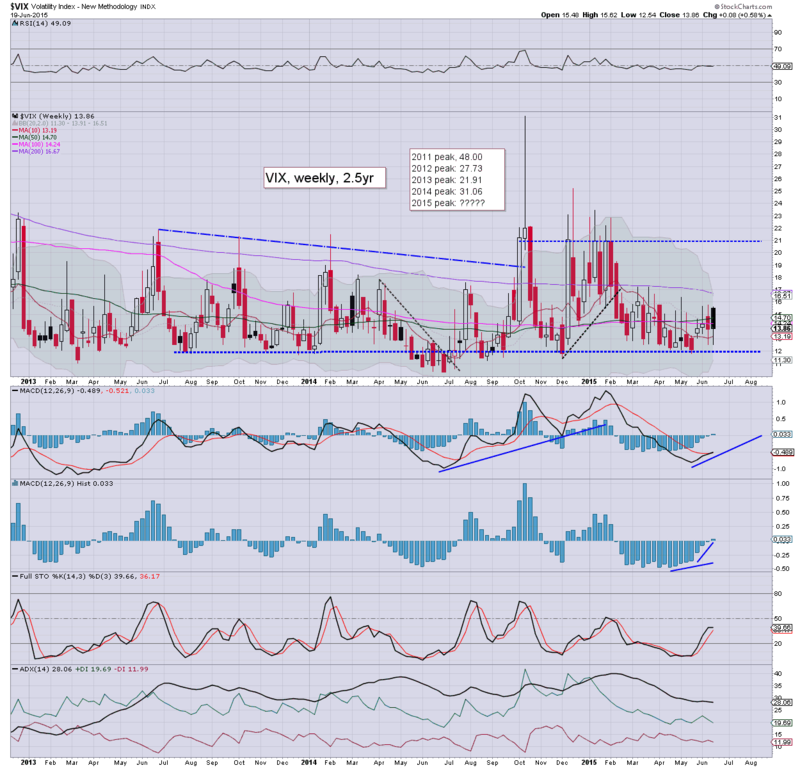 This is a crazy low VIX... higher volatility looks due next week. US equities open a little lower, but for now.. there is clearly no sig' downside power. Hourly equity cycles are offering a bearish MACD cross this afternoon... with a daily close in the 2105/00 zone. VIX remains remarkably low, +2% in the mid 13s. 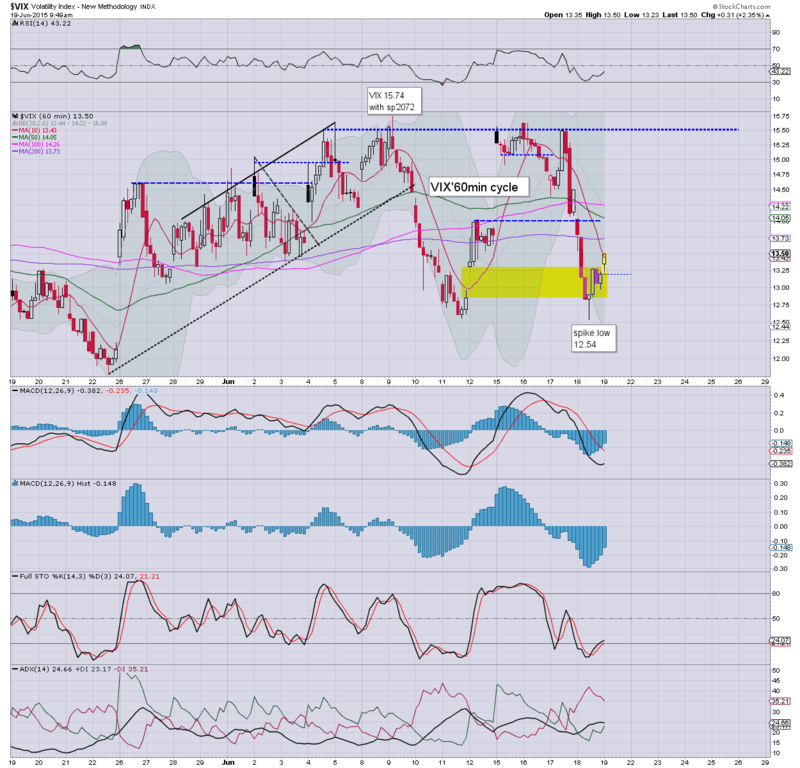 Oil is notably weak, -1.3% around the $60 threshold. As things are... bears have a better chance of sustained downside from 2pm onward. I'll certainly be looking for some of the rats to sell into the weekend. After all... even the most bullish out there have to acknowledge the worsening Greek situation. The extra $3bn of liquidity to the Greek banks this morning is barely enough to keep the game going for another 2-3 days. Good morning. 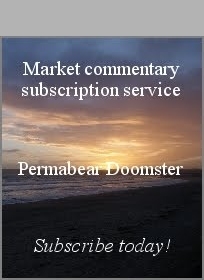 Futures are moderately higher, sp +4pts, we're set to open at 2125. USD is bouncing, +0.4% @ DXY 94.40s. Metals are a little weak, Gold -$1. 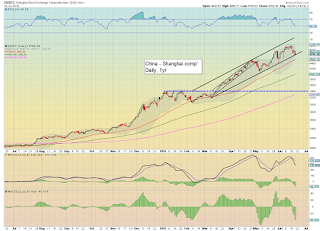 China saw a severe overnight drop of -6.4%... having decisively broken rising trend. So, market is set to open a little higher, but really... the will be extremely vulnerable today, and into next week. The 'Greek situation' remains an utter mess, and it would seem unlikely that any kind of deal will be reached today.. or early next week. End June remains the prime time for an official default. There is the somewhat scary possibility that the Greek banks will be shut next Monday.. and that would really spook the Greek populace. As for US equities.... the hourly cycle is offering a bearish MACD cross this afternoon, and I would expect at least some degree of 'rats selling into the weekend'. 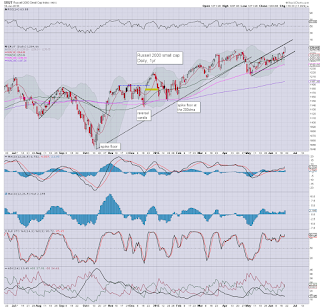 Equity bears should be seeking a weekly close under the 10MA, currently at 2108... a mere 13pts lower. Overnight action: China -6.4% @ 4478. 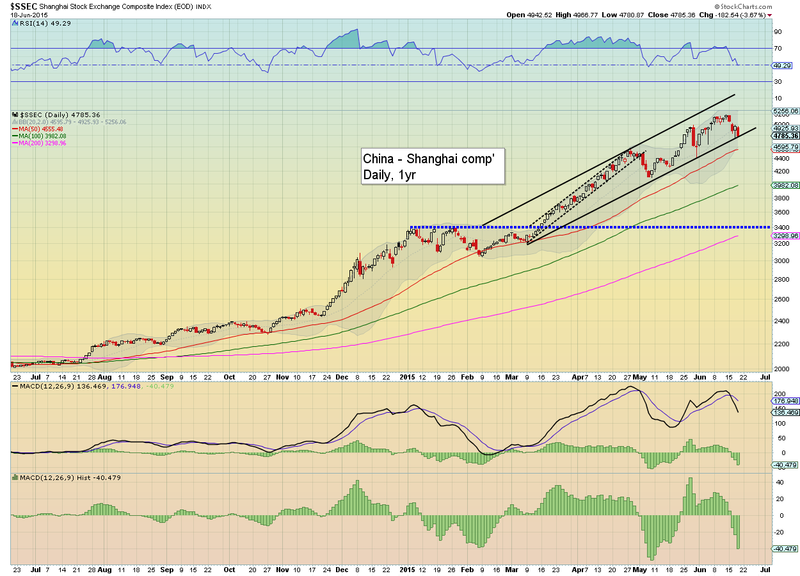 As I noted in my previous post, China was vulnerable... and we now have a clear break of rising trend. 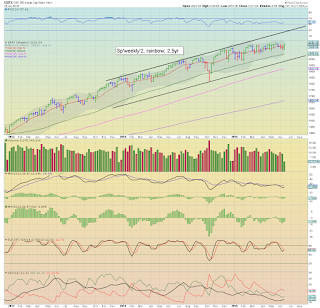 The 3400s are primary target... a full 1000pts lower to go. Will the Greeks wreck the market? 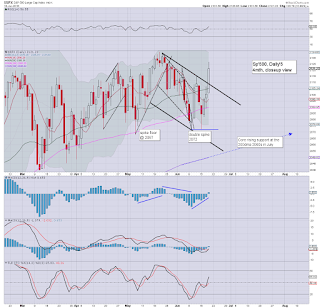 It was a day for the equity bulls, with the sp'500 +20pts @ 2121. However, the Greek situation is clearly at breaking point, and all things considered, a default looks probable in the near term. From a pure trading perspective, the more important is will a default cause some serious market upset? *weekly 'rainbow' candle has indeed turned to an outright bullish green, but if the market sells lower into the weekend, we'll likely settle an uncertain blue. As for the Greeks, to me it is increasingly clear. They are getting more moody by the day, and with talk of 'IMF/Troika criminal lenders', I can't imagine the Greeks not defaulting... unless they are simply wired billions of new 'unconditional' free money. The real issue is whether a default will quickly lead to an exit from the Euro. From what I read, the Greek people themselves aren't actually wanting to exit the Euro. In this situations though, things can develop fast - as we saw with Cyprus, and I think all traders should be mindful of a default/GREXIT across any given Fri/Sunday period. As for Greek equities, there is a break of lower rising support, a move to the summer 2012 low (471) looks probable with a default. Day to day volatility continues, and there is a significant probability that the mid term upward trend from the 3400s is about to be decisively broken. 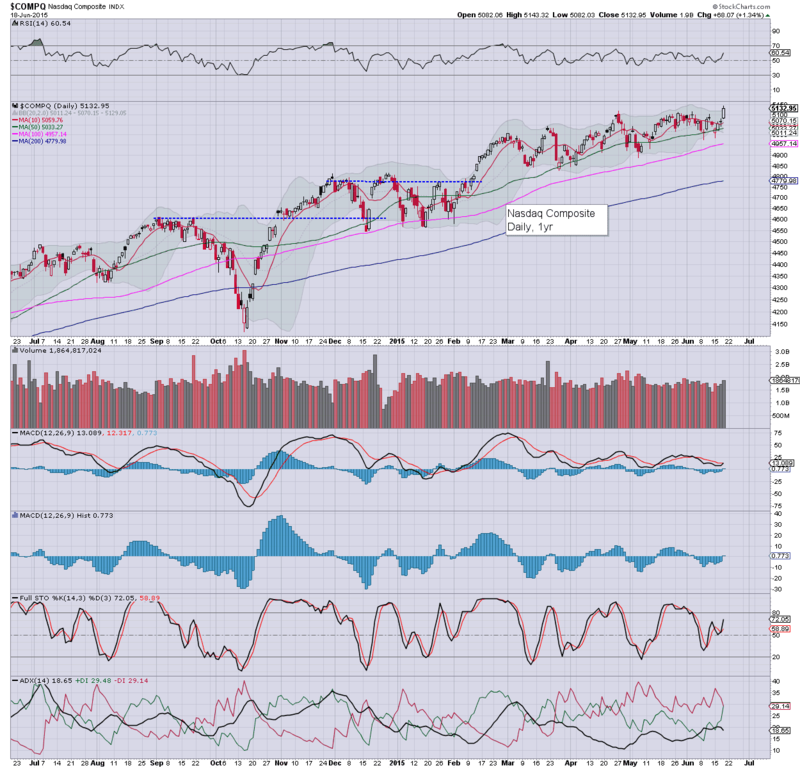 Best case downside this summer/early autumn remains the 3400s... having ramped from 2K in May'2014. 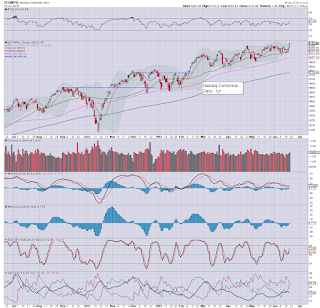 Renewed upside to new historic highs (>6124), looks due next year. 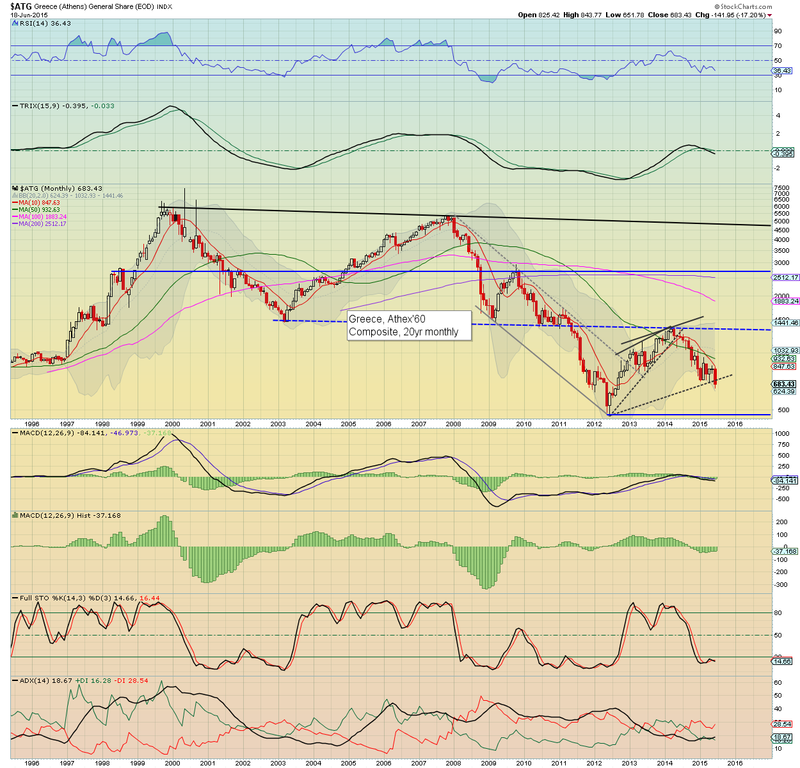 By 2017, the giant 10K threshold will be within range.. before the QE/paper bubble blows up. 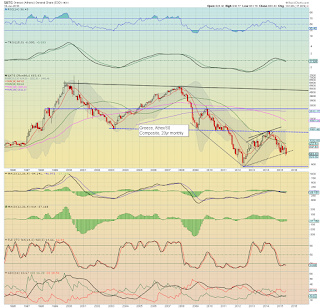 Friday is quad-opex..along with some index rebalancing, expect some serious chop into the weekly close. *Fed officials Williams and Mester are on the loose, one of whom might give the algo-bots an excuse to kick the market. Having watched Intel (INTC) fall from May 29th' - $34.75, to a June 15'th low of $30.94, I was looking for a bear flag to develop, and that is what I now see. Today's rally to $32.50 was effectively at the top of the flag... near the 50dma.. and for me, that merited taking a short position. I've Oct' option puts, so I'm not at all concerned about the ticking detonator clock. 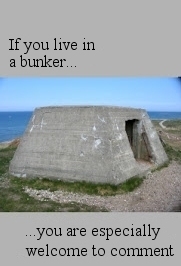 Between now and then... 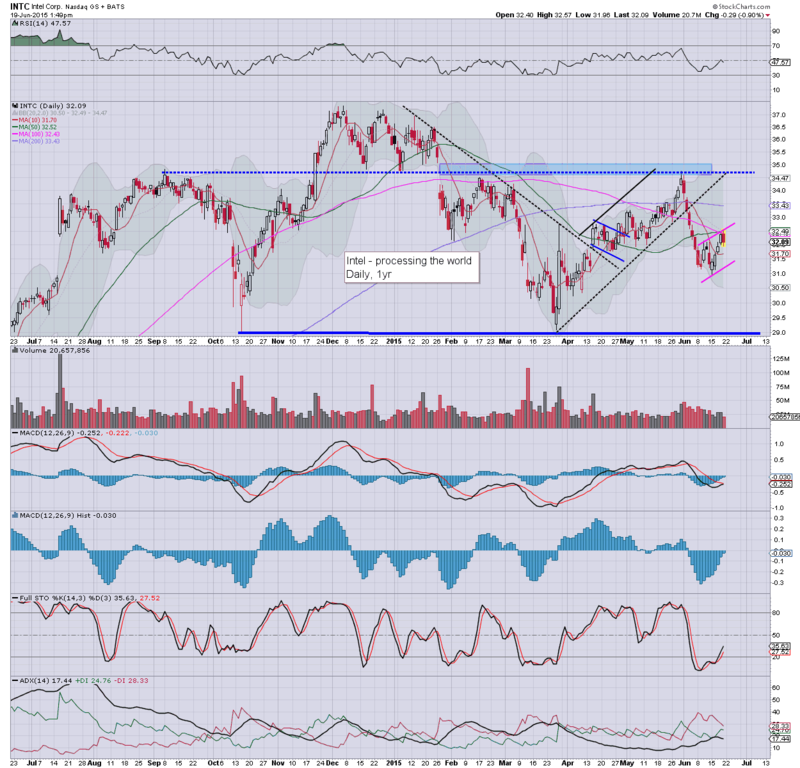 I have to believe INTC will at least hit $29.. if not the bigger H/S downside target of 26/25. 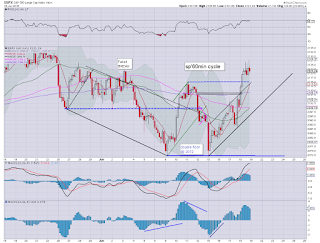 US equities closed broadly higher, sp +20pts @ 2121 (intra high 2126). 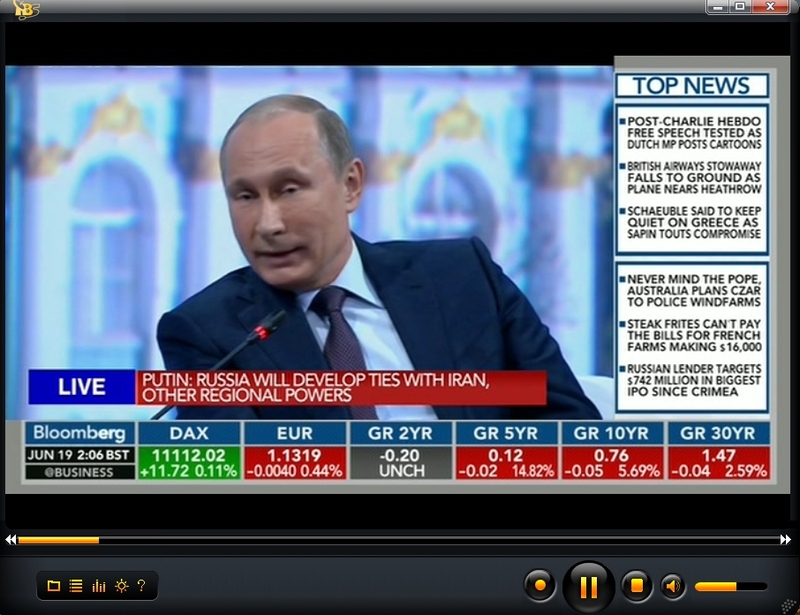 The two leaders - Trans/R2K, settled higher by 1.5% and 1.3% respectively. Near term outlook remains uncertain, with the threat of a move to 2135/40, or weakness to break the double floor of 2072. Certainly.. the 'Greek situation' will be a key determinate. *most notable aspect of the day, new historic highs in the R2K (1287) and the Nasdaq comp' 5143. Suffice to say, a day for the equity bulls, but overall... the gains look increasingly shaky as the Greek situation continues to build to breaking point. In my view, a large part of the market is in outright denial. A break below the double floor of sp'2072, is 49pts (2.4%) lower... that won't be easy... but it IS viable if the Greek situation worsens across the weekend.